BAKU—Azerbaijani ax murderer Ramil Safarov was promoted to the rank of lieutenant colonel of his country’s armed forces, according to the Baku-based minval.az news agency. While on a NATO-sponsored Partnership for Peace training outing in Hungary in 2004, Safarov brutally murdered an Armenian officer, Gurgen Margaryan with an ax, who was attending the same retreat. He was tried and convicted by a Hungarian court, which sentenced him to life imprisonment. 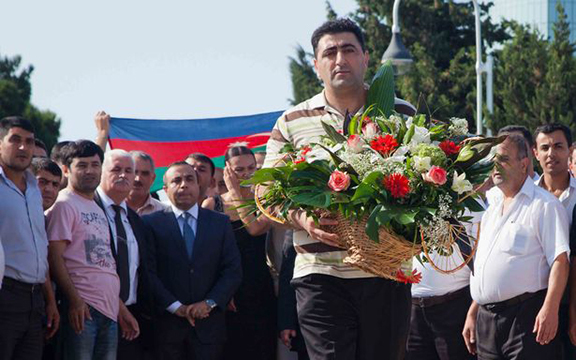 In 2012, however, Safarov was extradited to Azebaijan, where he was welcomed as a national hero, with Azerbaijani President Ilham Aliyev immediately granting him a pardon. Recent revelations about the government of Azerbaijan hiding a $3 billion slush fund in shell companies to bribe European politicians, known as the “Azerbaijani Laundromat,” confirmed that around the same time as Safarov’s extradition to Baku, a high-level Hungarian official was paid $7 million through one of the shell companies. At this rate, no one should be surprised if Safarov is one day named the commander of the Azerbaijani armed forces. Lt. Colonel Safarov will be promoted further to take full charge of the Ax battalion of the Azerbaijani Army, the most decorated battalion of their country. Axs are the number one military equipment produced by Azeris, in accordance with their long heritage of their mongoloid ancestors.